Today, I had the honor of being the spectator and supporter for my dear friend, Mark as he ran his 2nd marathon. At my side or rather, leading the way, was my favorite spectator/supporter — the enthusiastic and handsome man who ran by my side during the last 5 miles of my Boston qualifying marathon. Having always been the recipient of such acts of kindness, I had a thing or two to learn on the art of spectating. Our 1st cheer spot was from the road above the race course. 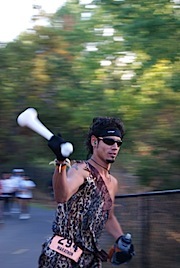 A hooting and a hollering were we — wildly ringing our cowbell and making a scene. 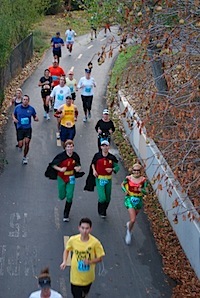 We arrived on time to survey the parade of runners (many in costume) who came through just ahead of Mark. He arrived right on time. It was like clock work, if you use the faster of the predicted pace we had for him. We snapped a few photos, then were back on our bikes just as quick as I could load up the camera — faster even. 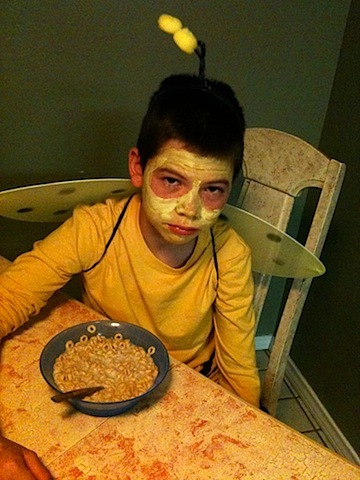 It was at that point when I came to fully appreciate the enthusiasm of my superhero supporter. You could almost see the cape waving behind him as he jetted down the road toward the local park. We arrived just minutes before Mark ran though. He’d made good time. With that, we were off again — peddling down the road towards cheer spot #3. I fought back my uneasiness with cycling amongst the cars and followed behind a huffing and a puffing — yet exhilarated and wondering if I too would earn a superhero spectator cape by the end of the day. 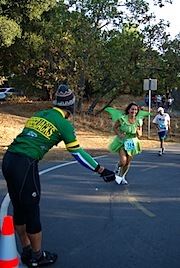 I mean, the only thing I’d promised Mark was that I’d be at mile 17 with a banana when he ran through. 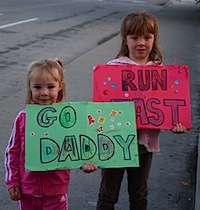 Several miles up the road, we arrived on time to see a whole new set of runners go through. Then, after a bit, the usual suspects began appearing. 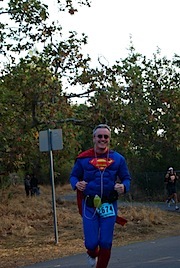 Superman, the Rockin’ Robins, Caveman, and a girl Running-with-Scissors were just a few of the familiar faces. 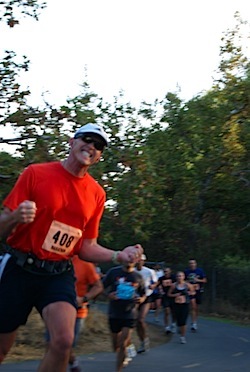 Then came Mark — looking strong and obviously feeling good. He sure seemed happy to see us out there crazily cheering for him. I was both proud of him and thrilled to have been the one to push him into his first marathon — even if it meant him accusing me of “breaking his foot” after he ramped up too quickly on the first marathon training attempt. Just look at him now! 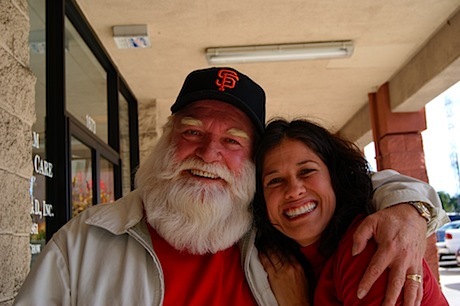 YaYa and I were out and about when we spotted Santa hanging out at the nearby coffee shop. I went on over and made small talk ‘cuz, although it’s not even Halloween yet, it’s NEVER too early to get on Santa’s good side. No matter how you look at it, it’s been a challenging week. A severely reduced level of exercise hasn’t helped. You see, I’ve continued to take it easy on my knee in hopes that I will finally be able to climb the stairs without feeling it tug. That has yet to happen. And yet, I have been SO in need of stress release. 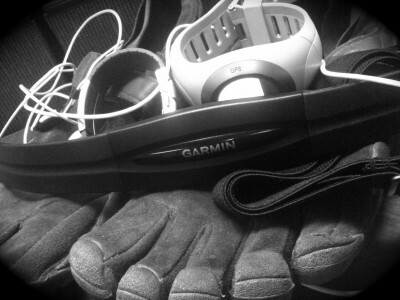 On Thursday, after a work phone conversation got very tense, I was thrilled to reach for my running bag. I skipped out on the Halloween festivities and headed to the bathroom to change. Sadly, my run plans to run were halted. I had no footwear. Today, I was finally able to cross off many of the items getting me all geared up this week. Of course that was AFTER sending a message to CMO Joe’s personal email account. I hate doing that but a girl’s gotta do what a girls gotta do — less she start biting more heads off. I celebrated this little bit of accomplishment with a somewhat hard run down the tracks. When I returned to find new issues had rolled into my email queue, I simply laughed. I pulled off my run gear one by one and piled it on my desk. Then, while still in my sweaty running clothes, I got back to work.